We love to travel, but our budget is limited. Some deal with a limited budget by splurging on one nice vacation each year. That's how Mom did when we were little. Mom would receive credits from her court-reporting service that she would redeem for Disney tickets or lodging at a beach condo. She had a savings account just for our annual vacation and put a little away each paycheck to cover travel, meals and entertainment. One of the biggest expenses of any vacation is travel. 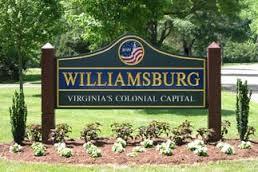 With gas prices lower this year, we almost drove to Williamsburg, VA. However, the 700+ mile drive was a deterrent. Fortunately we have a discount carrier, Allegiant, available to us from the St. Pete/Clearwater airport. For 2 round-trip tickets I paid $290. I redeemed MyVegas points for assigned seating. We picked an exit row that gave us a huge amount of legroom. Allegiant charges for luggage, but we didn't pay anything because our CabinMax bags fit under the seat in front of us. One downside to flying Allegiant is that they don't fly every day. We would have to arrive a day before I would check-in to the timeshare. I made the best of the situation by booking a nice hotel outside of Washington, D.C. I could have redeemed Hilton Honors points for a free room, but the weekend rate for the Hilton Tyson's Corner was just $89, so I opted to bank my points for another trip. Parking was free and we used the MetroRail to visit D.C. Besides the great deal I got for buying a car from Hertz, another benefit I received was a free weekly rental from their fleet. Our Toyota Camry cost us nothing but gas and airport facility charges. Our hotel in Williamsburg was a timeshare we mystery shopped. The hotel was a deluxe condo, with a full kitchen, living and dining room, bedroom, balcony and bathroom with both a shower and an oversized tub. The room was completely free, and I was paid $163 for attending and recording the three hour timeshare presentation. Washington, D.C. is a great value for visitors: virtually every site has free admission. While only there one night, we spent two full days there. We visited two Smithsonian buildings, the National Botanical Gardens, the grounds of the Capitol and the National Archives. In Williamsburg, I received two tickets to Colonial Williamsburg for $10 each (this was the gift I chose for attending the timeshare presentation). Our Sea World passes got us into Busch Gardens at no charge, including free parking. We enjoyed Busch Gardens so much that we visited four times. We also used our reciprocal garden benefits to visit the Norfolk Botanical Gardens. It was one of the nicest gardens we've visited. The last big expense is food. Since we had a full kitchen, we opted to stock up on groceries, alcohol and treats. We spent $75 at Walmart, which was more than we'd spend at home because we treated ourselves to cake, ice cream, beer and wine. We ate at Chili's one night ($26 for two), Longhorn ($16 w/ coupon), fast food twice ($10) and had beer at a bar in D.C. ($30). I earned $25 for performing one McDonald's mystery shop. While I am listing everything, we used gift cards for much of this, which reduced our cash outlay. As a further bonus, I didn't pay full price for the gift cards. For example, I bought a $100 gift card to Walmart using my American Express, which gave me a $30 credit. For our visit to Chili's I received free gas and a 5% credit card benefit for purchasing the gift card. The Longhorn gift card was free from a points redemption at MyPoints. This is amazing!!! I have got to learn how to be more savvy with finding the deals, using points and etc. Thanks! If you need any pointers on how to be a frugal traveler just ask away.